A ruckus has whats called a “CVT” transmission, or “Continuously variable transmission”. This style of transmission has no gears and relies on friction to run through the effective RPM range of the motor. 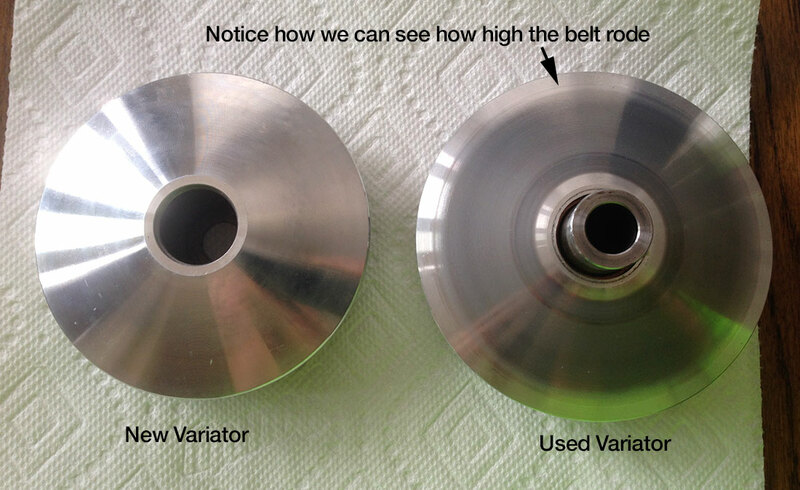 Choosing a Variator can be a little tricky and can result in great or poor performance. Typically CVT transmissions are not good at handling high torque applications, BUT are very efficient and cost effective. Almost all scooters use this style of transmission, whether its a Ruckus, a Buddy, a Vespa, even a lot of ATV’s use this style of transmission. Being that a CVT transmission has no gears tuning it is done via the variator. The name variator is derived from the “variable” portion of the CVT name. Variators come in all different shapes, sizes, & weights. It really comes down to your style of riding that dictates what will be best for you. To elaborate on that, usually you will be looking for higher torque, or higher top speed, and there is a middle ground if you want to be more in between the two. If you live in a hilly area a variator that will give you more torque is probably a smarter choice, conversely if you live in pancacke land where everything is flat night as well go for top speed. Now note that some additional tuning can be made in the clutch and clutch spring area as well, but we will leave that for another discussion. As I mentioned before variators come in all sorts of flavors. But before you go buying a new one first you should understand how a variator works. A variator is composed of three main parts: A drive face, the backplate, the drive boss and rollers. 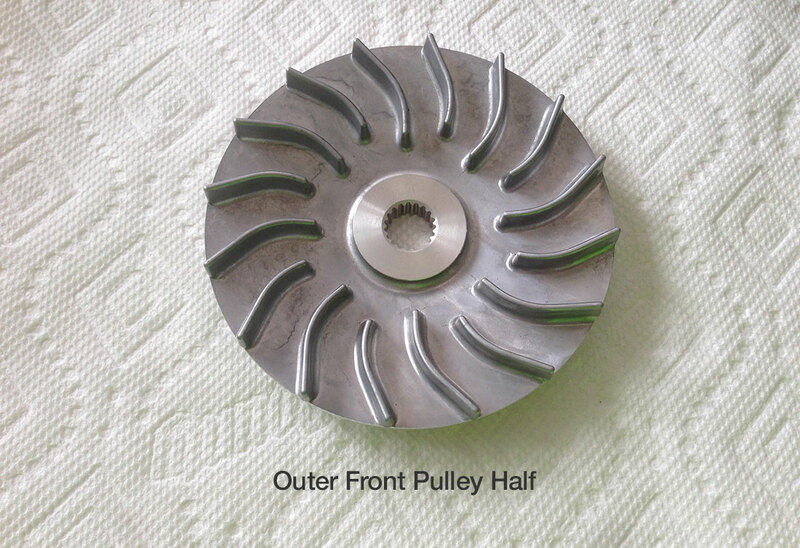 The variator is always used in conjunction with a “Outer Front Pulley Half” this is the fan looking thing that is at the front of the pulley system, and it has a smooth rear face. This part is affixed to the engine output shaft, as the RPM goes up this is the part that the output shaft rotates, which then rotates the belt and the variator. Look at the following diagram (we are looking at the variator from the side). As the RPM’s increase the rollers move out pushing the belt higher, causing it put more friction on the clutch. AS it lowers in RPM the belt sits lower reducing then friction on the clutch. Now, this brings us to actually choosing a variator, before we get into the actual variator there is one other lement that can directly impact variator performance. The heart of a variator are the weights. 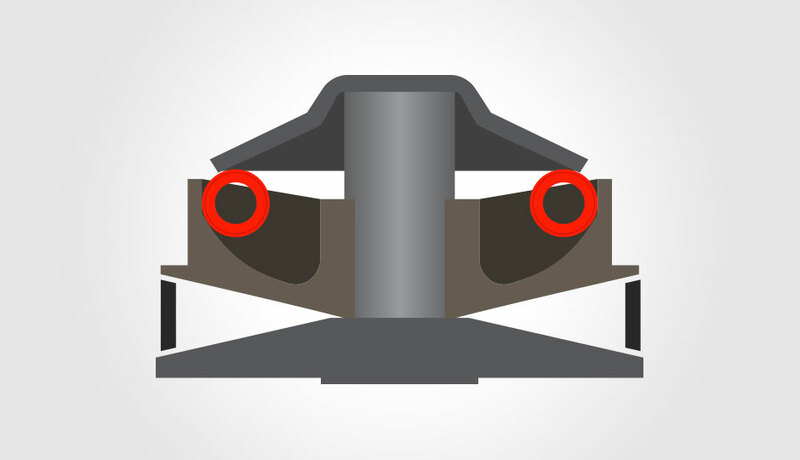 These are circular (or angled if slider weights) weights that affect how the belt is engaged and at what RPM. Generally speaking lighter weights = higher RPM, heavier weights = higher top speed. Now to twist your mind even more there are two types of weights out there; sliders and rollers. So technically the sliders allow the variator to open more givine higher top end, and also allows the variator to close more allowing better take offs. I personally have tried both, and still use rollers. Now I am not everyone and like most things it comes down to preference. On paper the sliders should out perform rollers, but this is not always true. Now some people will mix rollers and sliders, and it is very common to mix different weights as well… like 3 9g rollers and 3 11g rollers for example. This is the poit where you will really need to play with it to get it perfect. Ok so onto the actual variator itself. So variators come in different diameters, differenc drive face angles, and different materials (some stickier than others). Here is a pic of a few different variators, these particular ones are for a Honda Ruckus 50cc, but all motor apply the same theory. So just from looking at these 3 you can immediately see they are all different in 3 ways: diameter, drive face angle and material. Notice the Dorby is more of a matte finish and is actually the largest diameter but the most mellow drive face angle. This particular variator is one of the favorites amongst the 50cc Ruckus crowd. It provides great top end without compromising a ton of low end torque. Now the complete opposite of that is the Daytona Drag. This one is the smallest diameter and has a more aggressive drive face angle. This one I was actually using to mob the hills of San Francisco and its great for that BUT, you lose a little top end. Notice the right variator, you can see the wear line, its not all the way at the edge, however for this variator that was the best it could get after some testing. Keep in mind that just dumping heavier weights in your variator will not make you go faster. 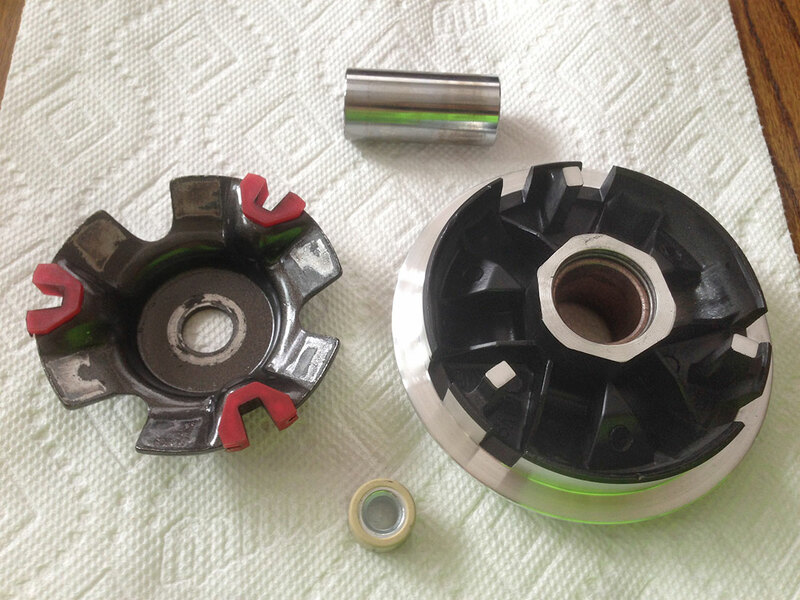 There are other factors that can affect this in the clutch, and the variator face angle and diameter. Hope this helps clean up some confusion, I am not a scientist this is just what I have learned, there are plenty of other resources out there for learning more about variators and transmission tuning.